Alaskan King Crab Legs - 10 lb. Jumbo Red King Crab Special. King crab harvested from deep within the icy-cold waters of Alaska's Bering Sea are a treat so uniquely Alaskan you'll have to see them first-hand to believe. These giant crab are truly a sight to behold. King crab have large powerful claws and long spiny legs. Red King Crab are the most highly prized of all Alaskan seafood. Hidden beneath the king crab's tough outer armor is a fine white meat that is renowned the world over by discerning chefs and knowledgeable diners alike. Alaskan king crab are harvested in giant pots then the crab are boiled and brine-frozen to lock in their pristine ocean-fresh flavor. The amazing crab fishery, popularized by the Discovery Channel show The Deadliest Catch, is truly an experience reserved for those with an iron resolve. 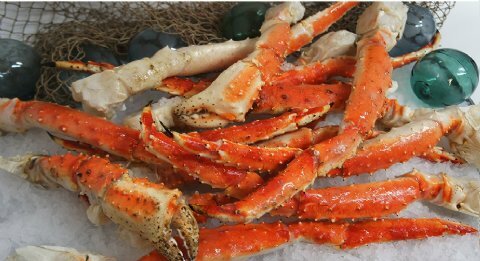 After watching even one episode it is easy to see why Alaska king crab legs command a high price! Our JUMBO size legs & claws weigh approx. 2/3 to 1 pound each! FedEx Priority shipping included. Additional fees apply for delivery to Hawaii locations. You can earn 780 JACKpot Points! on this product!